From the Kitchen of One Perfect Bite...A gastropub is a bar and restaurant that serves high-end beer and food without pretension. Who knew? Certainly not me. I had no idea what a gastropub was until I started looking for information about April Bloomfield. It turns out that she is a Michelin star chef who would have become a police officer had she not missed the application deadline for the academy in her hometown of Birmingham, England. By default, she followed in the footsteps of her sisters who were working in restaurant kitchens. Following graduation from the Birmingham College of Food, Tourism and Creative Studies, she continued her training in some very prestigious kitchens that included Kensington Place, Bibendum, Roscoff and the legendary River Cafe. She came to the United States and worked in the kitchen of Chez Panisse with Alice Waters before opening her own restaurant, a small and casual gastropub, called The Spotted Pig, in New York City. The restaurant features seasonal British and Italian food designed to highlight the simple beauty of fine ingredients. Portion control and elegant or fussy presentations are left to others. The Spotted Pig won a Michelin star in 2005 when April Bloomfield was just 31 years old. She and her partner, Ken Friedman, have since opened two other restaurants, the Breslin and the now defunct John Dory Oyster Bar. She has also written her first cookbook, A Girl and Her Pig , which is a collection of her best recipes complete with backstories that also reveal bits about her life and cooking philosophy. I found a wonderful link to a New Yorker feature about her that's very insightful and well worth reading. Take a peak if you can. She has accomplished a lot for a woman not yet 40 and she has earned her place on the Gourmet Live list of 50 Women Game Changers in Food. The recipe I've chosen to highlight the food created and served by April Bloomfield is a brunch entree that is served at the Breslin. This is an outstanding way to begin the day. Each element of the dish, and there are three, is delicious in its own right, but when they are brought together culinary magic occurs. The pancakes are large enough to please Paul Bunyon, though I suggest you serve them hot from the griddle. They are light when warm but tend to become heavy and damp as they cool. The ricotta cheese is the perfect creamy topper for them. My favorite element of the three is the orange syrup which is spectacular. 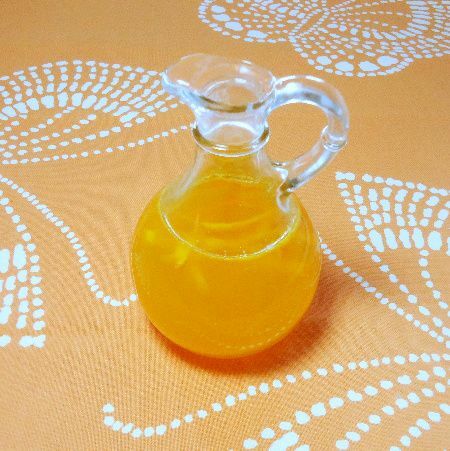 I was struck by the balance and restraint of this lovely citrus syrup and I will use it often for other dishes that I cook. This, coincidentally, makes a wonderful topping for those who do not use alcohol in their cooking. I hope that you will try this lovely entree. Here's the recipe. 1) To make syrup: Peel zest from the orange in long strips and julienne. In a saucepan of boiling water, blanch zest for 30 seconds. Drain and repeat. In a saucepan, simmer orange juice, sugar, water and blanched zest until syrupy, about 10 minutes. Let cool. 2) To make ricotta topping: Mix ricotta, sugar, lemon zest and vanilla seeds in a bowl. 3) To make pancakes: Whisk whisk flour, cornmeal, sugar, salt, baking powder and soda in a large bowl. In another large bowl, whisk buttermilk, egg yolks and ricotta. Fold wet ingredients into dry ingredients. In a large, clean stainless steel bowl, beat the egg whites until stiff but not dry; fold them into the batter. 4) To cook: In a large cast-iron skillet, heat a thin film of vegetable oil. Drop in 1/4-cup dollops of batter and cook over moderately high heat, 2 minutes per side, until golden and fluffy. Serve about 3 pancakes per person. Pass the orange syrup, ricotta topping and toasted almonds at the table. Yield: 4 servings. The following bloggers are also featuring the recipes of April Bloomfield today. I hope you'll pay them all a visit. They are great cooks who have wonderful blogs. Next week we will highlight the career and recipes of Nigella Lawson. It will be really interesting to see what everyone comes up with. If you'd like to join us please email me for additional information no later than Monday, April 16th. And your pancakes look delectable! 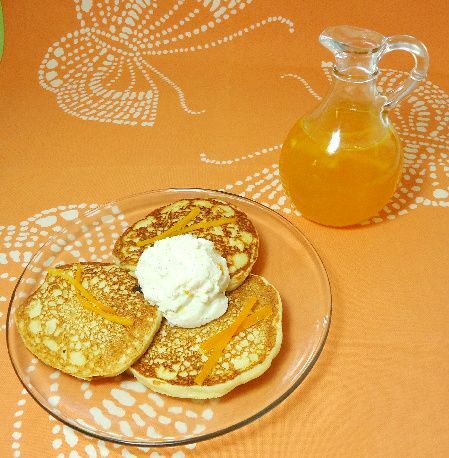 I have never made ricotta pancakes, but they do look delicious and with the orange syrup, yummy! Have a great day Mary! These really tickle my interest. I love what ricotta brings to baked goods, the topping and syrup are both intriguing as well. I would like to try these (right now!). 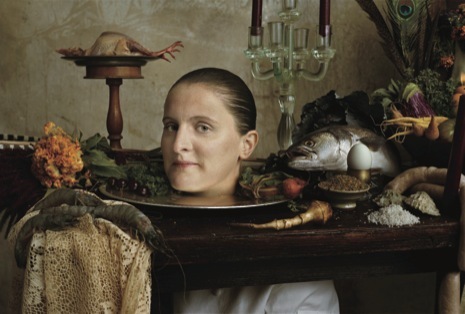 I found April Bloomfield a fascinating subject this week. Thanks for the link to the New Yorker article - it has even more interesting background on April. Your pancakes, by the way, sound and look just lovely. I think April would definitely approve. I love, love love ricotta pancakes, these are so light and fluffy! Like this recipe, a lot! Great post, Mary, and I wish that was waiting for me in my kitchen. A friend of mine loves April's cookbook - I'm so glad you are featuring her today! And the pancakes... oh yes, the yummy pancakes with that amazing syrup!! I'd love a big plate of those right now! These sound fantastic - I would really love to start my day with these. That Orange Syrup sounds like it could become an addiction! They look soooo goooddd..if only I could taste them. Have a great weekend, Mary. They look absolutely scrumptious!Have lovely weekend,dear! i never had ricotta pancakes but the orange syrup sounds very good! would like to chk out some info on this chef too. Yum, yum, yum!! This recipe is remarkably similar to her recipe for Cherry & Almond Pancakes that I made, which I love. Since I still have plenty of ricotta, buttermilk and white polenta left I think I will try them this way tomorrow morning! I also really enjoyed the article from the New Yorker Mary, as well as the fun photo. The citrus syrup definitely looks delicious, sounds like a good pairing for pancakes and I would use it on top of cakes too ! With the beaten egg whites and the buttermilk these must be so light! I've never tasted a ricotta pancake. Now I have the recipe, thanks. These look just divine, and so much better than with maple syrup, which I never use on my pancakes anyway! I only have one pancake recipe and use it over and over, but this I must try. Gastropub, how cool!!! Anytime I see anything with ricotta - I hit "print." This is no exception. The combination of a light fluffy pancake with ricotta and then some orange syrup is a grand flavor burst! What a fantastic and delicious recipe you left us Im dyeing to try t!! These pancakes sound delicious…I love the addition of the ricotta cheese. I never knew what a gastropub was either…live and learn! Nice post! I love orange, and these pancakes sound so yummy! I just wish I could find a satisfying alternative to syrups. They look really delicious. I am your new follower. Greetings from Spain. What a gorgeous dish for brunch. The spotted pig is such a wonderful place. Now I want to eat at a gastropub for dinner tonight. I once say April Bloomfield demonstrate how to butcher a pig live, at a conference. I think I'd rather watch her prepare these pancakes! What a wonderful recipe you picked. I could eat this for dinner. Thanks for sharing with us. It's funny how they say "without pretention" because most gastropub (at least in NYC) are FULL of pretention. :P These ricotta pancakes sound like they're worth bragging about though! Yum. This look really nice dear Mary, have a nice weekend! two of april's pancake and syrup recipes in one day--hoorah! poor typing due to wrist injury. What a lovely addition to my pancake recipes. Thanks, Mary. Very educational-I had never heard of a gastropub OR April Bloomfield! These pancakes are gorgeous and sound delish, esp with that orange syrup! These look delicious! I love a gastropub - they are very, very popular in the UK. Oh my - those pancakes look great. I have never made ricotta pancakes either so they look worth a try. I found it funny that Bloomfield wanted to go to Cadet school instead of become a chef! What a delectable recipe perfect for a special breakfast or brunch. I've bookmarked it to try soon. Appreciate your detailed writeup about April and the New Yorker article link. I'm so loving learning about all these interesting women and their food.